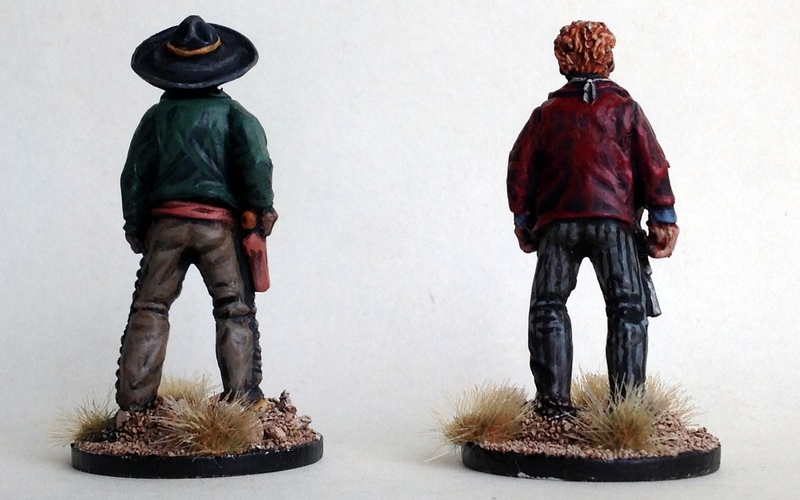 Good Rockin’ Brown and Filthy Harold – Western models! Another quick update to the blog, as it’s overdue! With my new job being much more taxing on my painting time, I’ve done a few little bits and bobs to keep things fresh for me and, more importantly, to be able to tell myself that I can still finish a model or two in time. That big Viking was among the lucky fellows to receive a paintjob, but here are two Western guys, first among a batch of about thirty such miniatures – also kindly gifted to me by Eddy of the Red Barons. Don’t ask me for the make of these models – I received them in unmarked black jewelry boxes. 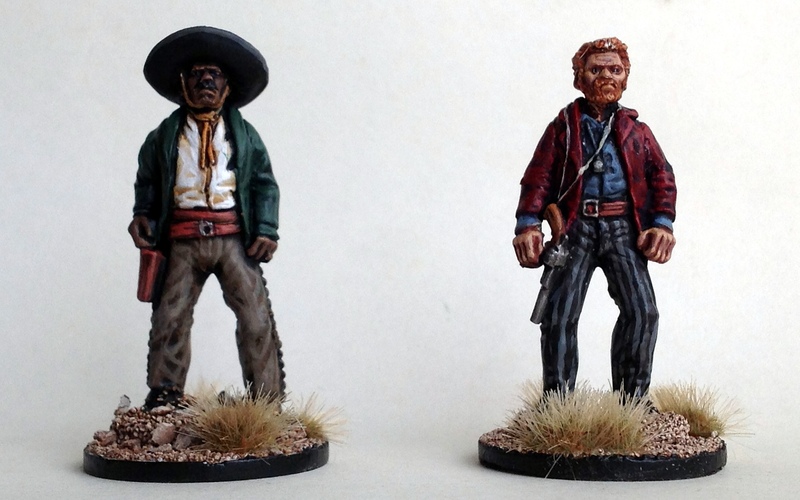 On the left we have Good Rockin’ Brown; I reckoned my Western skirmish model collection would have to incorporate at least one black or mixed race cowboy, as they’re just so oddball in the setting. I stole the name from the Roy Brown song Butcher Pete. You’ll probably figure out the inspiration for his compatriot Filthy Harold’s name, right? I looked at that humongous six-shooter at his hip and didn’t need much considering! The bases are simply white undercoated coarse sand shaded with AP soft tone. These are 40mm models, which is a small step up from 28mm, but I didn’t use any advanced techniques on these fellas – apart from Harold’s striped trousers, that is. These are average quality sculpts – most of the batch I got are models standing completely still with their hands hovering at their gunbelts, with only a few exceptions holding rifles. Still, one does not look a gift horse in the mouth! I’ll gladly continue painting the rest in between the more involved batches of models. All I need now is a good ruleset! If any of you readers have any good suggestions on the subject, please let me know in a comment down below!